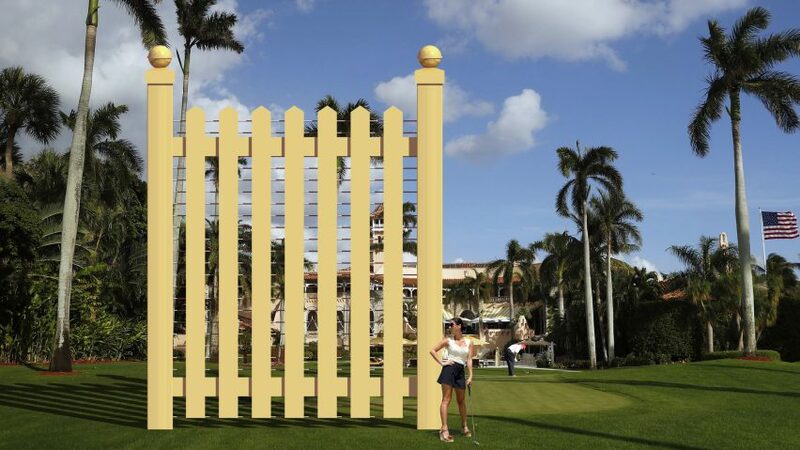 Architecture studio New World Design has launched a crowdfunding campaign to build a golden picket fence around US president Donald Trump's compound in Palm Beach, Florida, to highlight the absurdity of his plans for the Mexico border wall. Launched on platform GoFundMe, The US-Mexico Border Wall: A Study in Absurdity campaign aims to raise millions to erect the golden structure around Trump's Mar-a-Lago resort. Designed like a giant picket fence, the 30-foot-high (nine-metre) barrier would act as a prototype for a longer version along the border. It is intended as a parody of Trump's proposal, which Chicago-based New World Design described as "a grand illogical absurdity". The Chicago-based architecture studio aims to raise $570 million (£432 million) for the test build at Mar-a-Lago. This equates to 10 per cent of the $5.7 billion (£4.3 billion) that the president has requested to build the border wall, which triggered the longest US government shutdown in history. "We propose this as a means to keep the 'bad guys' in," said the team on the GoFundMe page. "This as an alternate to the irrational and inhumane border wall that will harm many in need, further divide America, and waste tax payer money." New World Design's satirical fence features a gold-hued finish intended to speak to "Mr Trump's decorating taste", echoing the golden cage that artist Ai WeiWei erected in New York to similarly mock the president and his barrier idea. New World Design's idea for the border is for the fence to be "lethally electrified on the Mexican side to keep out the droves of bad hombres (rapists, drug dealers, terrorists, murderers and immigrants and their children)". "The 'wall' would be electrified by six new coal-fired power plants built along the border, further supporting America's fossil-fuel future," said the studio, which has outlined a number of aspects of the parody wall on the campaign page. For example, it suggests that it will be built with Mexican labour and paid for by Canada. The total cost would be $5.7 billion but this excludes reality when determining cost and annual maintenance". The GoFundMe campaign is also intended as a counter to the crowdfunding effort launched to raise $20 million for Trump's version. If the target isn't met, New World Design plans to donate funds to the International Refugee Assistance Program charity. The Mar-A-Lago wall isn't the first project that New World Design has launched in opposition to Trump. Last year, the team proposed installing gold, inflated Pink Floyd pig balloons to block the "TRUMP" sign adorning the Chicago Trump building. "As we have had breaks from our regular projects we have used charrettes to distill political issues into design responses," principal Jeffrey Roberts told Dezeen. Trump's border wall, which formed a key part of his 2016 presidential campaign, has caused much controversy and encountered many stumbling blocks since its inception. It was recently revealed that all of the eight prototypes of the wall failed basic tests, while a graphic of the proposed wall that Trump revealed on Twitter prompted ridicule from designers. New World Design's fence follows a number of proposals that offer tongue-in-cheek wall alternatives, like a 1,954-mile-long dinner table and a flat-pack Ikea kit. Renderings are copyright New World Design Ltd.